Welcome to a convention center like no other. 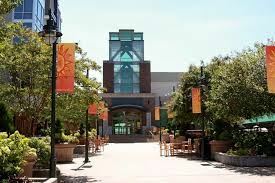 Located on the historic downtown square in Fayetteville, Arkansas, the Fayetteville Town Center is a versatile venue with a professional staff to help you plan the perfect event whether it is a business meeting, dream wedding or fundraising gala. Surrounded by the beauty of the Ozark Mountains, the breathtaking views and natural scenery serve as a backdrop you'll never forget. Special Features: We have two hundred covered parking spots in a parking garage under our facility. Our facility also has beautiful outdoor areas for your event and photo opportunities.